Kingston Bathroom Accessories Chrome Clawfoot Tub Straight Supply Stop CC44151: This Straight Stop 1/2-inch IPS x 1/2-inch or 7/16-inch Slip Joint is built to last. The highest quality standards are used to precision manufacturer a top of the line product. Important features of this BRAND NEW Fixture: Complete Item! Everything necessary for installation is included. Matching Accessories Available - Easy to Install - Installation instructions included - Sold with Both Hot (Red) and Cold (Blue) Button, Can be used for either - Straight Stop with 1/2-inch IPS x 1/2-inch or 7/16-inch Slip Joint - The 1/4-turn straight valve features a stylish vintage lever which controls the movement of water through and from plumbing fixtures. 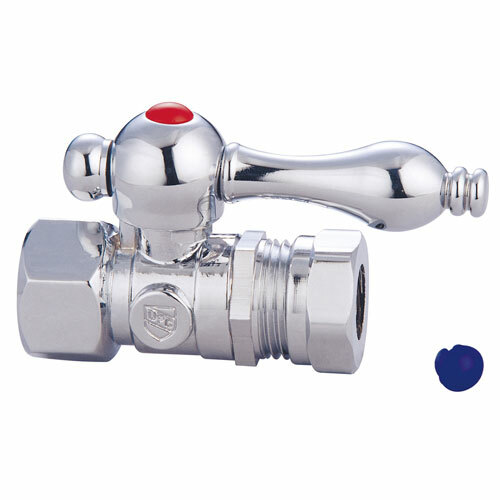 The valve is made of solid brass built for durability and dependability and also comes in a variety of finishes to better coordinate your kitchen/bathroom. - 1/4-Turn Straight Stop - 1/2-inch IPS X 1/2-inch or 7/16-inch Slip Joint - English Vintage design - High Quality Brass Construction - Chrome premier finish designed to resist fading and tarnishing. This fixture is manufactured by Kingston Brass and is part of their Vintage collection.